Here is a money-saving tip: SECURE YOUR HOME. If you have APD Officer A.J. Rodriguez conduct a home security inspection and it passes, you could qualify for as much as a 20% reduction on your home owner insurance. That is a savings of $200 or more a year. Last Wednesday night, November 8th, many of us met Officer A.J. Rodriguez at one of Allandale's homes to learn about home inspections. The inspection was at the invitation of Allandale's Neighborhood Safety Coordinator, Laura DiCarlo. She scheduled it with Officer Rodriguez and sent out an invitation to neighborhood block captains. The inspection itself doesn't take much time. If you schedule one, it probably will take less than 30 minutes. Basically, Officer Rodriguez checks items listed on the Texas Insurance Code form, "Report of Inspector's Findings, Texas Insurance Code Reduction in Homeowners Insurance Premiums." (Click here to download the Form). If you pass, he will file it with the Texas Department of Insurance and you can notify your insurance company and ask for a rate reduction. The reduction can be as much as 20% depending on your provider. 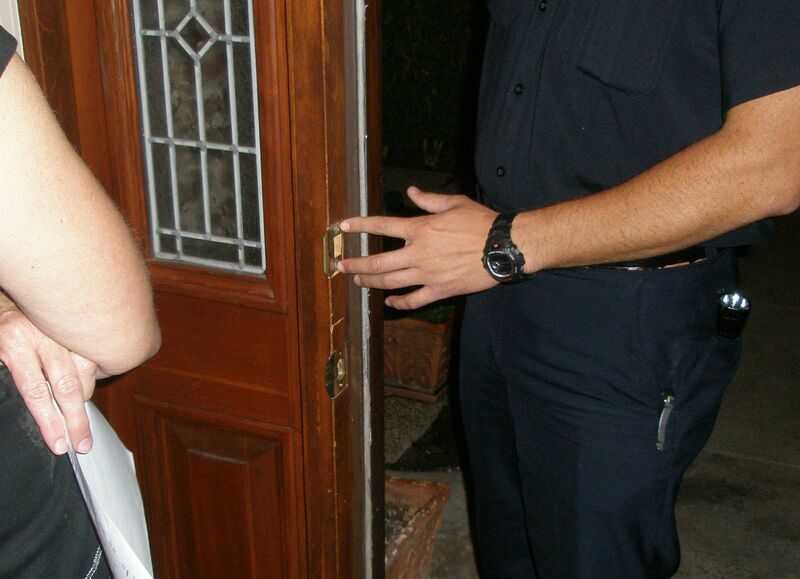 What Officer Rodriguez looks for in his inspection are things like strength of exterior doors, quality of door locks, and security of double doors and sliding doors. He also inspects window locks looking to see if they are secured by auxillary locking devices? If you have an electronic burglar alarm system, he will verify it meets specific requirements. While we followed Officer Rodriguez around as he was conducting the inspection we asked a number of questions. One security measure not included on the inspection form is lighting. Everyone agreed proper lighting was important and it was pointed out that effective and neighbor-friendly security lighting shines in toward the house not out toward the street and the neighbors. Many of the things that you can do to make your home secure is just using common sense. Lock your doors when you leave. Use a bar on sliding doors to reinforce securing the door. Install motion detector lights. and keep your garage door closed. Even though none of this is new to people, many don't do it consistently. Some tips I gained from the meeting include keeping your blinds and shutters closed at night if you own flat panel TV. Make use of a light timer when out of town. Keep shrubs and bushes trimmed below windows to eliminate possible hiding places for burglars. You can call or e-mail Officer Rodriguez (974-4527 or armando.rodriguez [Email address: armando.rodriguez #AT# ci.austin.tx.us - replace #AT# with @ ]" target="_blank">armando.rodriguez [Email address: armando.rodriguez #AT# ci.austin.tx.us - replace #AT# with @ ]) to set up a home inspection of your own. A successful home inspection will not only save you money on your home insurance it may save you the expense of replacing stolen items.